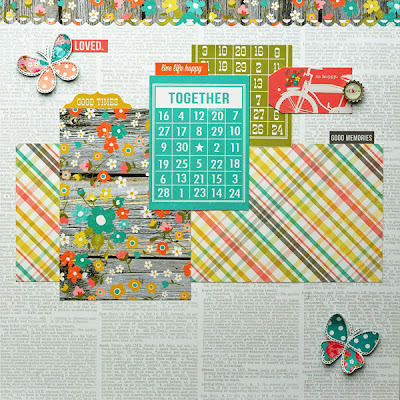 Last week I shared sneak peeks of the projects I did as the May guest designer for My Creative Scrapbook. I worked with the beautiful Main Kit, shown above, which features Simple Stories gorgeous Vintage Bliss collection, along with embellishments from Basic Grey and Maya Road. The reveal of the kits took place yesterday so I'll share my projects, in full, over the course of this week. 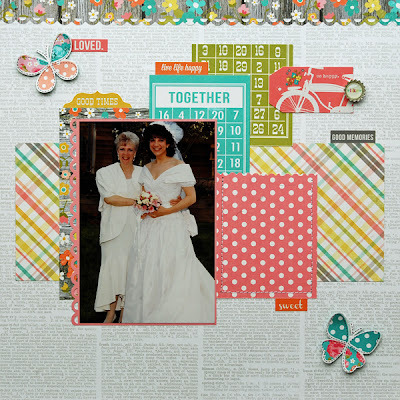 The first project is a layout featuring a photo of me and my Mom on my wedding day. I created a pocket, to the right of the photo, using a piece of pink polka dot paper. Because the pocket holds a journaling tag, I sewed the paper to the page to reinforce it. I loved the Basic Grey mini bottle caps so much I used a trio of them on this page, two as flower centers and one as the tab on a tag. The butterflies are cut from a piece of patterned paper and adhered to the page with 3D foam squares to give them some lift. I also gently bent the wings back to add the look of motion and dimension. 1. The base of the page is built upon the horizontal piece of plaid paper. 2. The matted photo and pocket are adhered to the page. The pocket is sewn on. 3. Embellishment layers are added to the photo and the pocket. 4. Another look at the finished page with the title now added and embellishments added or tweaked a bit. Thanks so much for visiting today. I'll be back tomorrow with another kit layout to share. You are a master of layering, and I just wanted to say CONGRATULATIONS on the new DT! I am seeing your name pop up everywhere!!! GORGEOUS! I LOVE how you layered everything, pinning this post for later! Love the sweet photo and, wow, what a gorgeous page, Lisa! It was so interesting to have a peek at your process! You make layering seem so simple and seamless! Congrats on the new gig! That layout is so bright, happy and just the perfect balance! Love everything about it! Lovely colors! It's a very happy LO. This is gorgeous!! I love love love the colors, the photo, the pocket you created and LOVING the butterflies!! ooooo what a beautiful page. I love the colors and layering as always and what a differnt take on a wedding page..Thanks for shairing how you bring it together. love the text paper and of course the LO you created !! Gorgeous work and photo!! Great layout, Lisa ! I love the colors on this kit. 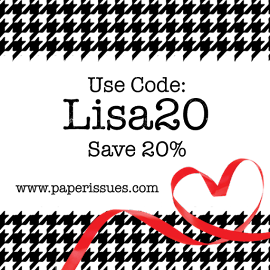 Wonderful design and I love how you showed how you builded up your page! Oh what a happy page! Love seeing it come together. Wow, love, love this! Beautiful job using this line! Loved seeing your a peek into your process. Just amazing! Awesome page Lisa!! Love seeing how your layout came together. And I so love this collection!! What a lovely page, lisa...and the pops of color are divine. :) The photo of you is wonderful, too. great work! Beautiful photo of you and your Mom, Lisa. And your page is stunning! I really love the way you used the Simple Stories collection! 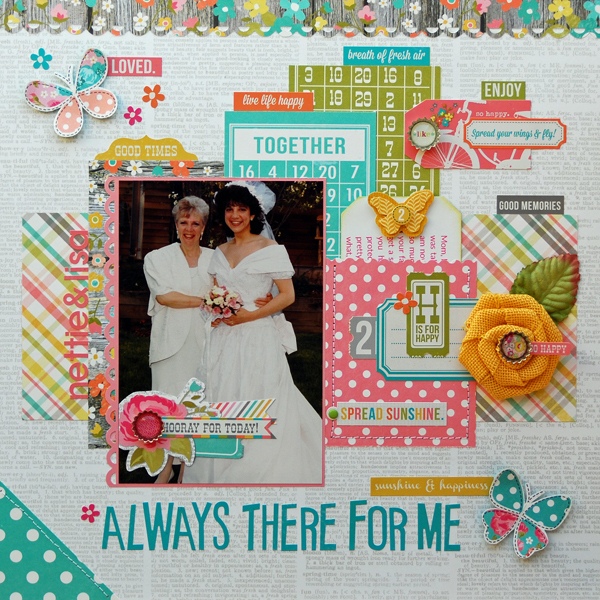 Hey Lisa - super fun layout! I'm trying to email you at lswift1110@frontiernet.net but it keeps getting returned. Can you email me back at paigetaylorevans@gmail.com or paiget@northridgepublishing.com? THANKS! 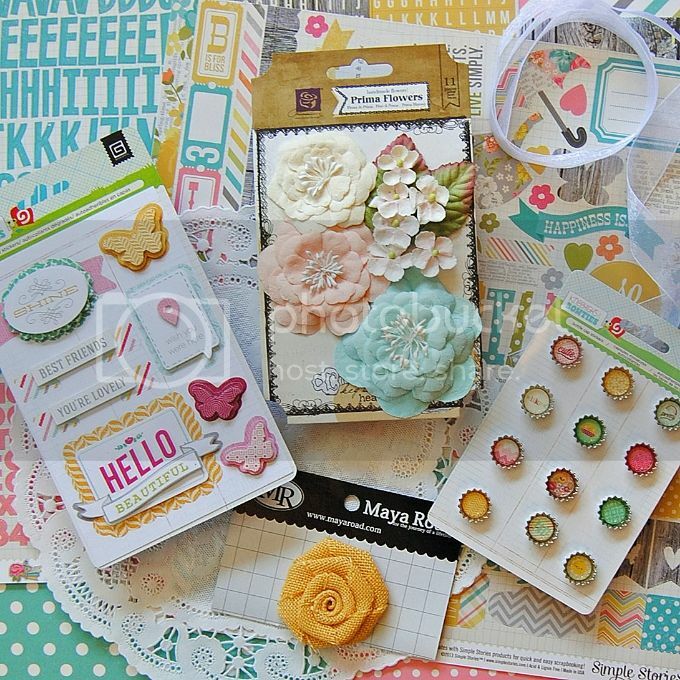 Thanks for sharing your layering process! Congrats on the guesting! I love that line from SS. This is just gorgeous! The placement of PP and embellies just draws you to that beautiful photo! What a great kit - love the colors. Beautiful page and bride. Thanks for linking up, Lisa.